Featured Server auctions run every two weeks and are open for 72 hours. During this time, you may place a bid on the Featured Servers page. In order for a server to be eligible for a featured slot, it must have an uptime of at least 70%. To bid, simply press the “PLACE A BID” button and enter an amount. By placing a bid, you are committing to paying the amount bid if you are among the top five bidders. Failure to make a payment will permanently ban you from any future auctions. Once the auction has ended, the top five bidders will receive a notification that they’ve won a featured spot and have 48 hours to pay. Payments can be made with PayPal via the payment links delivered with the winning bid notification, the My Servers section of your profile, or the Featured Servers page. Servers that are in the 6th or 7th positions at the close of the auction period will be placed in “Standby.” This means that if any of the top five bidders fail to pay, you will be offered a feature slot at your final bid amount. You may decline this spot without penalty. After the payment period has ended, there is a final 24 hour payment reconciliation period. During this period servers in “Standby” will be contacted if any of the top five bidders failed to pay. After payment reconciliation the 5 winning servers will be featured for two weeks. 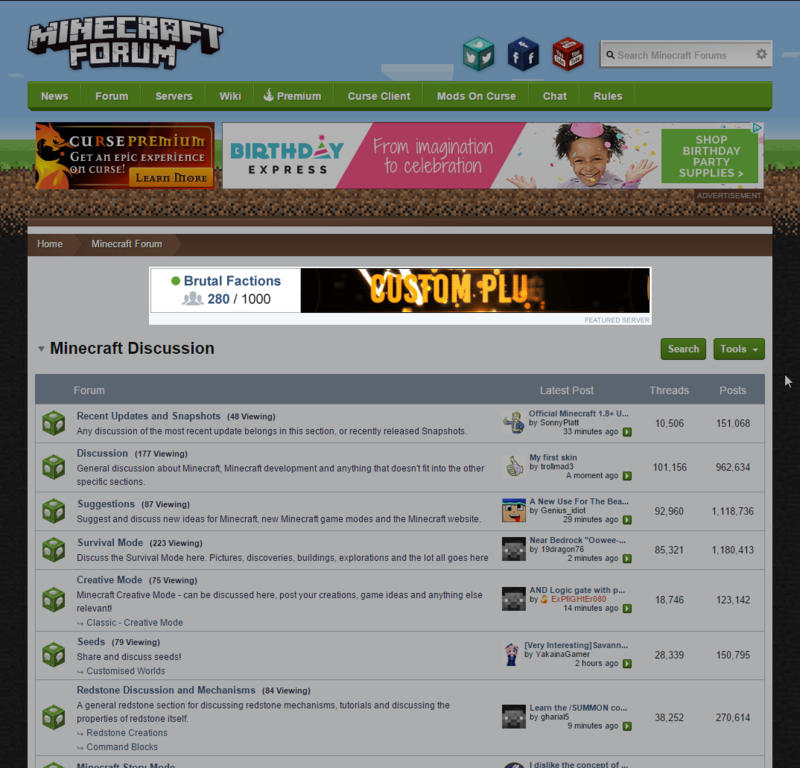 Winning servers will be featured in high-visibility placements across Minecraft Forum Servers and Minecraft Forum. As the official community destination for Minecraft, and with more than 6M unique visitors per month, your server will be in front of more passionate Minecraft players than anywhere else. 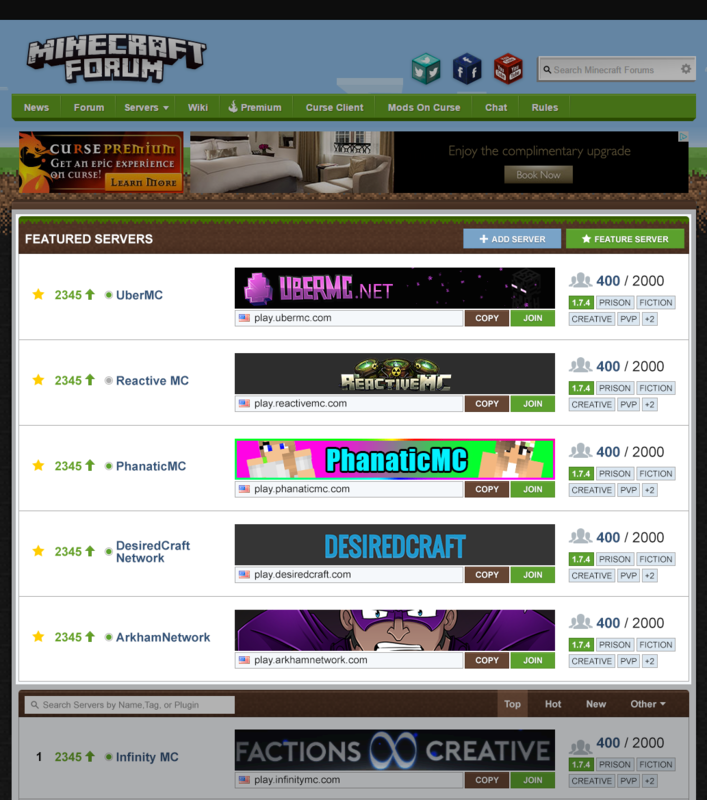 Featured placement at the top of the server list on Minecraft Forum Servers. Featured servers will be shown in bid placement order by default. 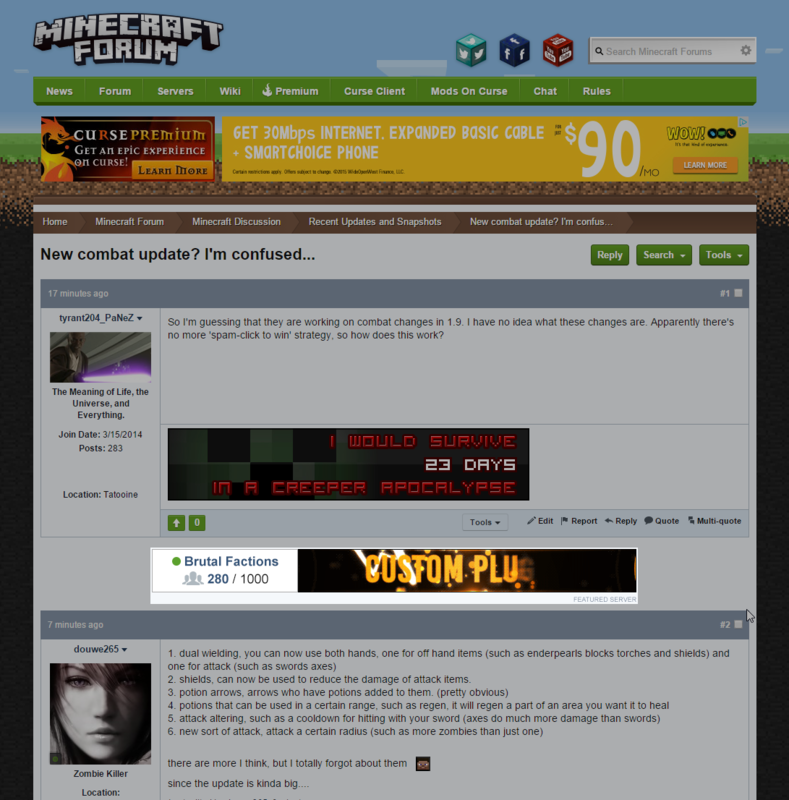 In-content forum thread placement on Minecraft Forum. Featured server banners will display based on their bid placement. First place will display 35% of the time, second place 25%, third place 20%, and fourth and fifth places 10% each.